Alpine Speedwell is a perennial that forms a mat of deep green leaves topped with deep purple flowers from early summer through late summer. It will grow from 4" to 6" tall and spread from 8" to 12" wide. Plant Alpine Speedwell in full sun in well drained soil. 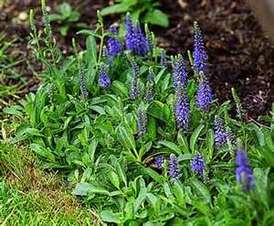 Plant Alpine Speedwell in a Rock Garden, Miniature Garden, alpine trough, as edging, along pathways, massed over a large or small area, or in containers. It is deer resistant and is drought tolerant once it is established. Alpine Speedwell is also a Firewise Plant.